For her second solo exhibition at Steve Turner, Halifax-born, Los Angeles and Toronto-based Hannah Epstein has transformed the darkened gallery into outer space. 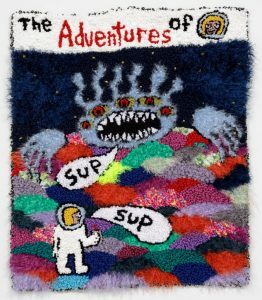 She fills this fantasy world with spot-lit, hooked rugs of varying sizes, depicting an invented comic book superhero called Superchill. In her work, Epstein blends the tactile and the digital. She has a long history of creating animations, videos and online games, in addition to creating a cast of hooked rug characters. 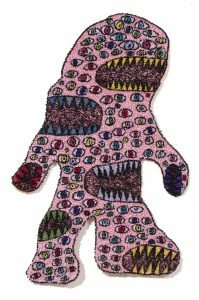 In her previous exhibition, Monster World (2018) her funky colorful creatures inhabited the walls eliciting awe and smiles. 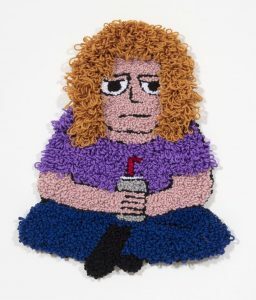 While her work has an outsider art appeal, it is created by a savvy insider. 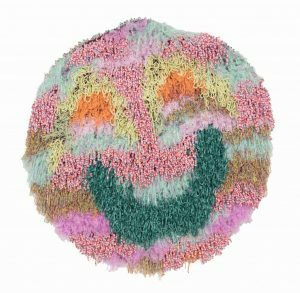 The term “post internet” is a catch-all phrase that refers to artists who do not necessarily make art on or about the internet, but create objects that are informed by internet culture. In many ways, Epstein is a quintessential “post internet” artist. 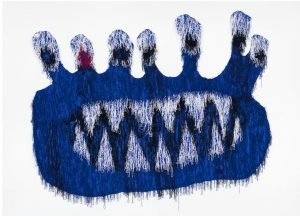 Upon the walls in the gallery are more than twenty-five tactile objects, hooked-wool rugs with varying lengths of dangling yarn in a wide range of shapes and sizes. Each artwork is lit by a carefully constructed video projection that illuminates the silhouette of the shape, while simultaneously projecting twinkling yellow stars and other animated fragments that interact with specific aspects of the rugs. 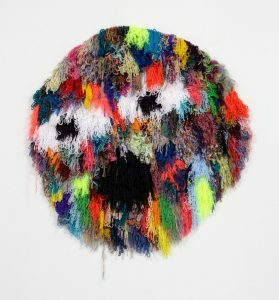 For example, when looking at Cruhnch (all works 2018), a pink-toned monster filled with a pattern of different colored eyeballs and mouths with exaggerated teeth, pixelated orange and yellow flames suddenly erupt to surround the figure. A similar animation appears above the piece, Alien Flex. The use of projected animation as a lighting source allows Epstein to create a dynamic rather than static environment in which the unexpected occurs. The narrative that drives the work centers on the adventures of Superchill‘s trip to outer space. During her trip, despite passing by a wide range of circular shaped planets (some drawn from popular culture like Planet Accidental Ninja Turtle) and interactions with alien monsters and other creatures, Superchill is undisturbed. Epstein’s imagining of this trip is to present an alternative to a superhero with powers, creating instead a superhero who stays calm, or super chill. Any trip to outer space, free or not, would be anxiety-producing, as leaving earth and flying through the universe in a spaceship is risky. Yet, in Epstein’s presentation, outer space is filled with smiling planets, friendly aliens and a star-filled sky. She even includes a free video game entitled Cloud Blaster in which viewers assume the role of a blond-haired astronaut who blasts evil-faced clouds with a golden genie lamp. While Superchill could be anyone, she has an affinity with Epstein and might even be a self-portrait in much the same way Trenton Doyle Hancock‘s TorpedoBoy is his alter ego. Although she is depicted as buxom and muscular in Superchill Issue No. 1 Cover Page, in the other works, including Superchill Buddha, she is just a regular girl. 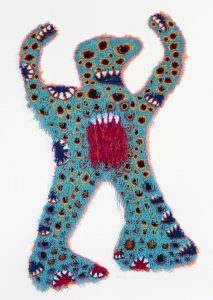 Epstein’s creations have the aura and appeal of large-scale “Ugly” dolls or other stuffed toys that are popular with both children and adult audiences. In this enchanting installation, Epstein successfully combines the analog and the digital to create an evocative experience that inspires viewers to think about what exists beyond, while simultaneously being grounded in the here and now.